This was a bit over the top compared with his usual rant. But his was not the only voice to broadcast this message. A few hours later, Russian Lt. Gen. Alexander Lapin, Chief of Staff of the Russian Armed Forces in Syria, told reporters at the Hmeimim air base in Latakia that the Syrian army had recovered 85pc of the land captured by Islamists, with15 percent (27,000sq.km) still left to liberate. He then flew the reporters to Aleppo city, where Russian military police patrol parts of the city. DEBKA Weekly’s military and intelligence sources report that so confident are they of victory that Bashar Assad and his allies are deep in preparations for what they are calling “an historic event” scheduled for a date as early as mid-October. It is to be staged at Al Qa’im (which is still held by ISIS), an Iraqi town on the banks of the Euphrates in Anbar province. The program will consist of a victory parade of the four allied armies who by then will have routed the opposition and Islamist forces in Syria’s six-year long war, and speeches by Iran’s supreme leader Ayatollah Ali Khamenei, Assad and Nasrallah, with the flags of the four victors flying overhead. With only four weeks left before the event, the pace on the battlefield was planned to pick up this week, in the hope of keeping to the timetable, despite a delay caused by an unexpected counter-attack by the purportedly defeated ISIS fighters of Deir Ez-Zour on Tuesday and Wednesday (Sept. 12-13). The Syrian army, the pro-Iranian Shiite militias and Hizballah hoped to put Deir ez-Zour behind them and race forward to positions for their next offensive against the Islamic State’s bastions of Abu Kamal and Mayadin, ahead of the American-backed militias. Russian air support and intelligence accompanied them all the way. The plan is to reach the big day after routing an estimated 8,000 jihadis, who have gone to ground with their families in a part of the Euphrates Valley which spans Deir ez-Zour and Rawa in Iraq’s western Anbar province. Top ISIS leaders are believed holed up there for a last stand, including possibly Abu Bakr al-Baghdadi. The combined army intends to cross into Iraq and throw a siege around Al-Qa’im, where they have arranged to rendezvous with the pro-Iranian Iraqi Population Mobilization Units (PMU) heading in from southern Iraq. For the first time, Syrian/Hizballah soldiers will fight ISIS alongside an Iraqi Shiite militia. The Russian officers, like the Syrian, Iranian and Hizballah commanders of the operation, are confident of arriving at their destination ahead of the American-backed SDF and YPG forces, who will be left straggling behind on the western bank of the Euphrates. 6. 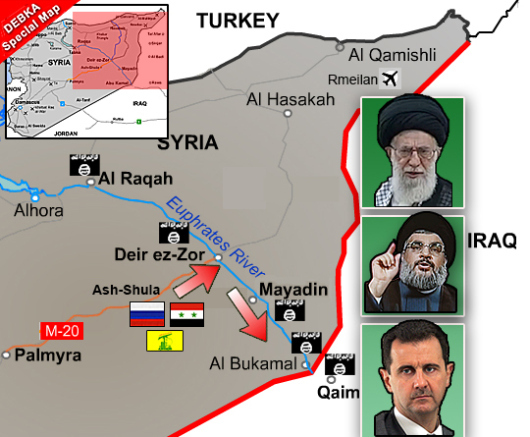 They estimate that seizing and purging ISIS-held Al Qa’im will take them about three weeks, up until mid-October. 7. After that, the grand victory celebration will go ahead. The three top leaders to be honored there will be flanked by large retinues of defense and military chiefs. Revolutionary Guards Corps commander Gen. Ali Jaafry and the commander of Iranian forces in Syria and Iraq, Gen. Qassem Soleimani, will be invited to collect kudos and watch the parade of the four victorious allied armies. The content of the speeches can be envisaged. Ayatollah Khamenei will declare that the Shiite Revolution, having achieved a historic victory and marked out a path to the shores of the Mediterranean, is strong enough to redouble its demand for every last American soldier to be removed from the “Shiite Crescent” of Iran, Iraq and Syria. Assad will proclaim himself and his army the victors of the long Syrian war and underline the restoration of every inch of Syria to the hands of his Alawite dynasty. Nasrallah will hail Hizballah’s epic evolution from a militia to an army, which enjoys regional relevance. Tehran and Damascus have asked Iraqi Prime Minister Haidar Al-Abadi to join them on the dais, thereby symbolizing Iraq’s attachment to the Iranian-Syrian-Hizballah alignment. They have also sent out feelers to Moscow to find out if the Russians want to be represented at the victory parade and if so, by whom. They are still awaiting the two replies. His Hizballah, which forms the backbone of the Syrian assault in the Deir ez-Zour region of eastern Syria, has been halted in its tracks by fierce resistance from ISIS and Al Qaeda’s Nusra Front. Whereas they successfully pushed ISIS out of its Lebanese-Syrian border enclaves earlier this month, Hizballah and the Syrian army are unable to break through the strong Islamist formation fighting in the Syrian Desert and Euphrates Valley. Called on for help, Moscow ordered two Russian submarines in the eastern Mediterranean, to fire seven cruise missiles at ISIS targets southeast of Deir ez-Zour on Thursday, Sept. 14, and so break the impasse. The Russian defense ministry reported that they targeted weapons and ammunition stockpiles, communication centers and command posts.